PAW Patrol fans rejoice, as there is a hot new live show coming for 2017, Paw Patrol ‘Race to the rescue’. With all your favourite characters from the hit TV show. PAW Patrol Live! “Race to the Rescue” shows that “No job is too big, no pup is too small!” and shares lessons for all ages about community, social skills and problem solving as the characters each use their unique skills and teamwork. When Mayor Goodway goes missing during the day of the Great Adventure Bay Race, the pups come to the rescue. Families can join Ryder, Chase, Marshall, Rocky, Rubble, Zuma, Skye and Everest for the show’s first tour in UK and Ireland. Running at 80 minutes, PAW Patrol Live! “Race to the Rescue” includes two acts and an intermission. The show is set to engage audiences with Bunraku puppetry, an innovative costuming approach that brings the PAW Patrol characters to life on stage with their vehicles and packs. The performance features music, dance and an original script as well as classic theatrical scenery along with a high-tech video wall that visually transports families PAW Patrol locations such as Adventure Bay, The Lookout, Seal Island, Farmer Yumi’s farm and Jake’s Mountain. Special interactive video allows the audience to participate in the show via interviews, solving puzzles with the Pups, following Mayor Goodway and much more. You don’t have long to wait either, with shows coming as soon as August 2017. 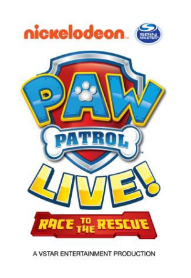 You can grab tickets for PAW Patrol Live! “Race to the Rescue” throughout August at the additional seven locations go on general sale from Thursday 13th April 2017 at www.pawpatrollive.com/uk. Tickets for the Glasgow, Belfast and Dublin shows are already available to purchase but are selling out quickly. Fans can also sign-up on the site to receive exclusive PAW Patrol Live information about the show and venues, read about the PAW Patrol Live! characters.